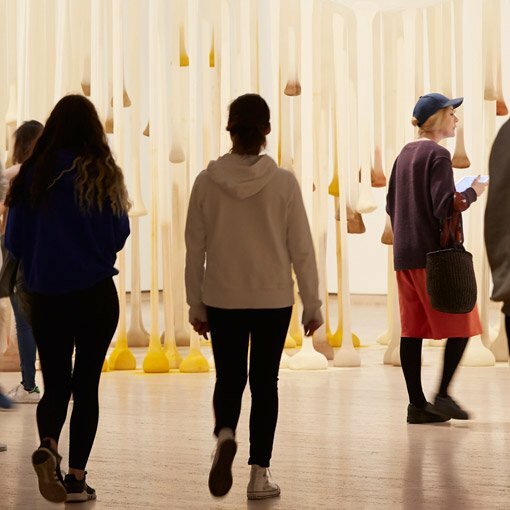 Brazilian artist Ernesto Neto’s Just like drops in time, nothing is a supple architectural form made from spiced-filled polyamide fabric — aka pantyhose. It was first made during a residency Neto undertook in 2002 at the University of Newcastle, at the invitation of the Art Gallery of NSW. 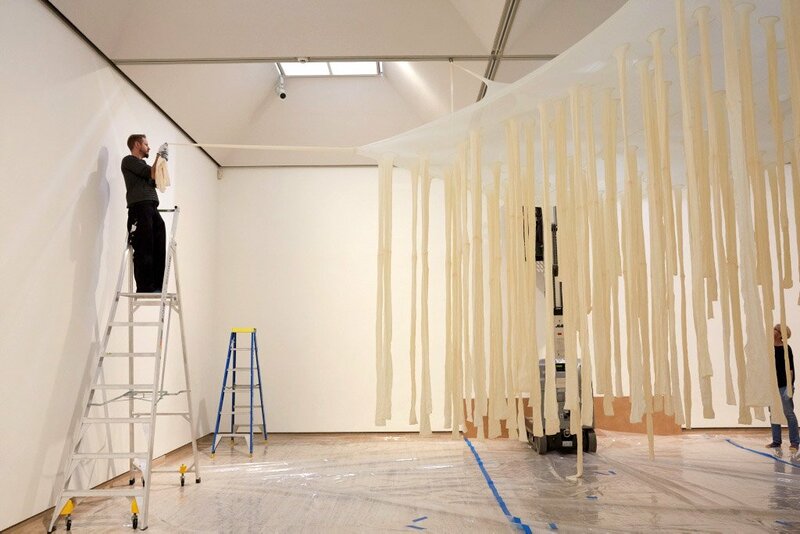 Soon after, his international career sky-rocketed, with the artist going on to take his sensory and stretchy brand of installation art to venues such as the Panthéon, Paris (2006), and Park Avenue Armory, New York (2012). 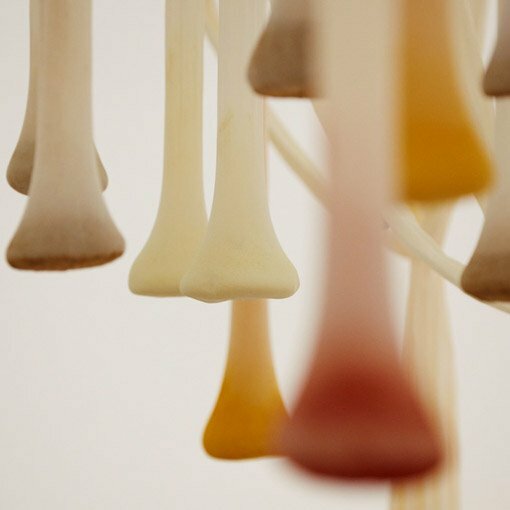 From its first outing at our Gallery in 2002, Just like drops in time, nothing captured the imagination of visitors. 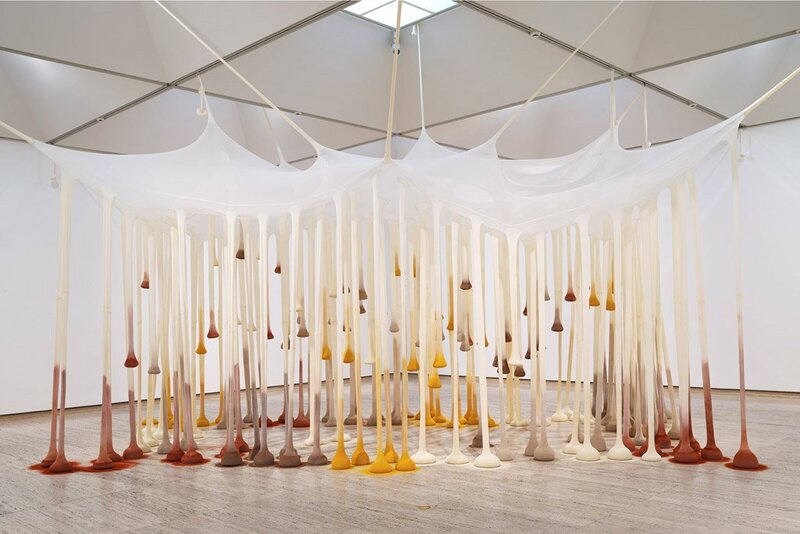 The work was acquired that same year and has since travelled widely, from the Glasshouse Regional Gallery in Port Macquarie to the Auckland Art Gallery. 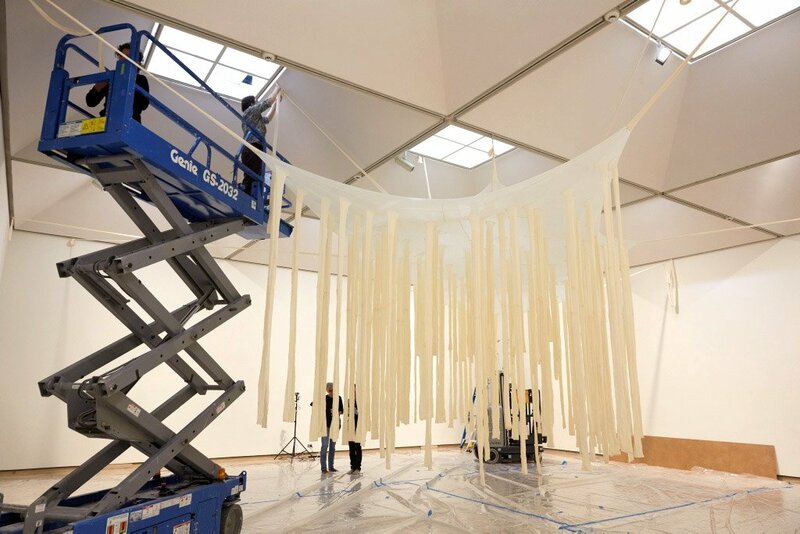 However, upon inspecting the work in 2017 for the exhibition Spacemakers and roomshakers , which presents installations from the Gallery’s collection, conservators and curators determined that it no longer met the original intentions of the artist due to unavoidable change in the fabric. Since the early 20th century, but particularly from the 1960s, the principles of permanency, perpetuity and uniqueness, which long determined an artwork as an object that was acquirable and collectable, were upended. The object disappeared and in its place emerged the actions of Joseph Beuys, the videos of Nam June Paik, and the performances of Carolee Schneemann. The materials of timber, clay and stone were replaced with the landscape itself in the spirals of Robert Smithson, the walks of Richard Long, and the silhouettes of Ana Mendieta. Artworks became ephemeral, intangible, reproducible, immersive and interactive. So, what is to happen when these types of contemporary artworks are collected by an institution? In regards to Just like drops in time, nothing , Neto considers the work to be a living entity and thus readily accepts that it will go through many evolutions throughout its life. He likens the process to the way our bodies renew themselves, through regenerating our very own cellular ‘fabric’. Indeed, the material qualities of the work are inherently linked to its conceptual qualities, with Neto describing the fragility of the work as a reflection of the world today: an embodiment of the precarious state of balance upon which we all rely. So, for the past 10 months, in close consultation with the artist and his studio, the Gallery has coordinated the re-fabrication of the work. We were fortunate to track down Giselle Penn, who works in the textile department at the University of Newcastle, and who was part of the original group of craftspeople who assisted Neto in 2002. Penn still fondly recalls listening to his stories of Rio de Janeiro and the thrill of working with an artist whose local beach was Ipanema. Her value to the project cannot be overstated and the Gallery is sincerely grateful for her commitment, enthusiasm, diligence and care. Some 450kg of new spices, including turmeric, cumin, pepper, cloves, fenugreek and paprika, were also purchased for the work’s latest iteration. 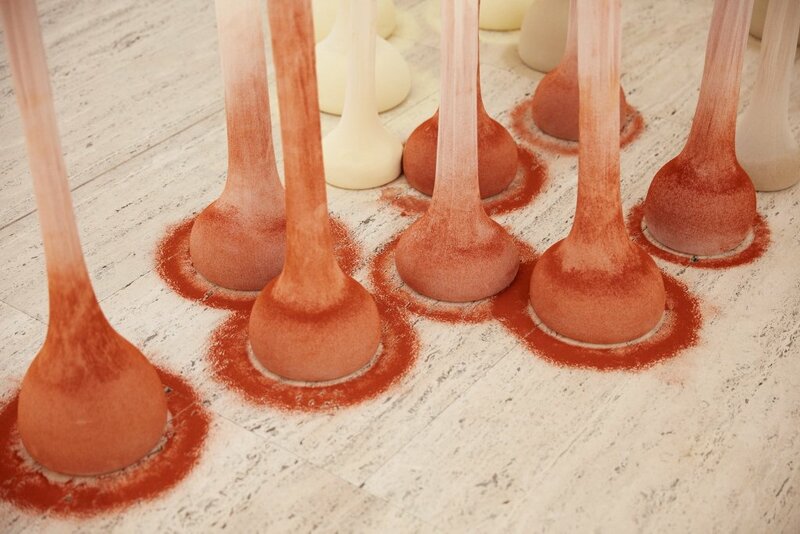 And it’s that scent that first captures your attention as you arrive on lower level 2 of the Gallery. This is a work you will smell before you see! You can go behind the scenes of the installation in this slideshow. Click on one of the small images to begin. A version of this article first appeared in Look, the Gallery’s members magazine. Previous post: Who painted Henry?